Sober Look: US Basel III implementation delayed; called "same complicated system for judging risk that failed in Basel II but with more complexity"
US Basel III implementation delayed; called "same complicated system for judging risk that failed in Basel II but with more complexity"
As discussed before (see post) Basel III implementation carries significant costs. In the US the implementation has its unique problems (discussed here). The approach hits securitization particularly hard, making ABS (short maturity credit card and auto loan paper) tougher for banks to hold - yet encourages banks to hold more sovereign debt (less capital required to hold Italian bonds than a pool of auto loans for example). Also small businesses that are not rated will have a tougher time obtaining loans because such loans will require more capital. In fact a portion of small business lending will shift to non-bank entities such as mezz funds who will charge higher rates. To add to the fiscal cliff worries, US bank regulators were going to impose Basel III rules at the start of 2013. Luckily that deadline has been pushed back, as concerns grow about this new set of rules. WSJ: - While taxpayers wonder if Washington is going to throw them off a cliff of scheduled tax hikes, another potential economic calamity has been postponed. On Friday, bank regulators announced that they will not impose complicated new rules on New Year's Day. Let's hope they don't impose them on any other days. The Federal Reserve, Federal Deposit Insurance Corporation and Comptroller of the Currency issued a joint release saying they will no longer require U.S. banks to follow the so-called Basel III capital rules by January 1. Created by a college of global bureaucrats who enjoy meeting in Switzerland, the new rules are brought to you by the same people who encouraged banks to load up on mortgage risk before the panic of 2008. Their new rules encourage banks to load up on sovereign debt. This makes perfect bureaucratic sense, since the world's governments have proven to be hands-down the issuers with the most dishonest accounting. The US is not the only country concerned about Basel III. 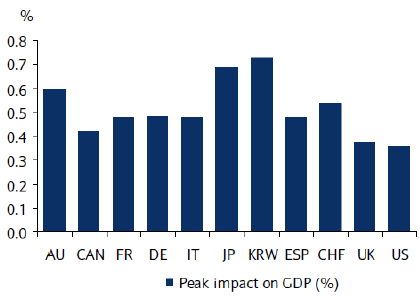 The impact on the US is actually expected to be smaller on a relative basis than on a number of other nations' economies. Asian nations will see the largest impact, particularly South Korea. In Europe, Switzerland ("CHF" in chart below) will be impacted the most, in part due to Credit Suisse (see discussion). WSJ: - The FDIC's own Director Thomas Hoenig sees in Basel III the same complicated system for judging risk that failed in Basel II "but with more complexity." Using theoretical models that have failed in practice, the rules assign "risk-weights" to different assets, divined by an almost endless series of calculations. For the largest banks with the resources to spend on regulatory arbitrage [see discussion], this is an opportunity to get risky assets officially designated as safe. But the cost of this complexity, and the burden it will place on small banks in particular, is no doubt a big reason why the feds have taken a step back from the regulatory cliff. In their Friday note, the bank overseers said they were moving back the deadline "in light of the volume of comments received and the wide range of views expressed during the comment period." Certainly a wide range of negative views have been expressed, including by the Bank of England's Andrew Haldane and Vasileios Madouros. Their research shows that Basel's intricate models were hardly of any use in predicting which giant banks would fail during the crisis. This should surprise no one. The essential function of the Basel Committee is to strike political compromises among global regulators, who have rarely been confused with the best and brightest minds in finance.